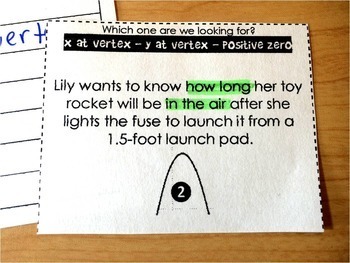 In this sorting activity, students have to decide if a word problem is asking them to find the x at the vertex, the y at the vertex or the positive zero. 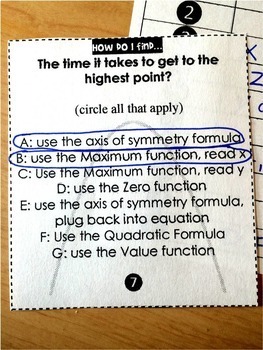 There are no problems to solve, which forces students to look for keywords to determine which part of the parabola a word problem is asking them to find. 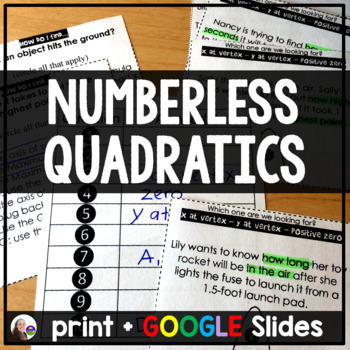 This activity helps students remember to look for the keywords in future quadratic word problems. This activity works well as an introduction to quadratic word problems where students need to find the time it takes an object to reach its highest point, the time it takes an object to fall back to the ground and the maximum height an object reaches.